Keeping up with the modern trends, Domestic manufacturer Lava Mobiles has also launched the upgraded version of Lava Iris 405, dubbed as Lava Iris 405+. The upgraded version of this smartphone is powered by MT6572 1.3 GHz Dual core processor and sports upgraded Android 4.2 jelly bean operating system. Apart from these changes other hardware specs remain similar. The Lava Iris 405+ embodies a 4 inch LCD display with 480 X 800 pixel resolution giving you 233 pixels per inches which is quite usable. The dual SIM smartphone is 9 mm thick and weighs moderate 127 grams. The MT6572 chipset under the hood incorporates a 1.3 GHz dual core processor which is common place in budget Android smartphones these days. The RAM capacity is 512 MB and the internal storage is 4 GB. You can further extend the memory to 32 GB using microSD card. The primary camera is of 5 MP similar to the predecessor and enjoys Flash support for low light conditions. Front VGA camera is also present for video recording. The battery capacity is 1400 mAh which will give you 10 hours of talk time and 657 hours of standby time on 2G. Connectivity features include 3G, WiFi, Bluetooth with A2DP and aGPS. The price has not been specified as of yet, but we are expecting it to be around 5,000 INR. 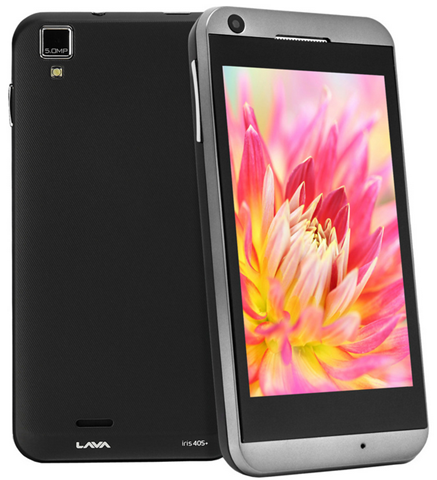 The Lava Iris 405+ is a minor upgrade from its predecessor. The phone will be apt for first time Android users and will be soon available for purchase from Flipkart. It will compete with phones like Intex Cloud Y3 and Xolo A500L.